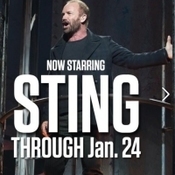 Sting.com > News > Sting.com Members-Only Contest – Sting's Run in "The Last Ship" Extended – Win Tickets to See Him in the Show PLUS a Meet & Greet! We're excited to share the news that Sting's engagement in "The Last Ship" will extend through January 24 at the Neil Simon Theatre! On the heels of his sold-out, standing-room-only debut performance on Tuesday night, the producers have announced that Sting will now appear for an additional two weeks, through January 24, in the role of Jackie White. Tickets are available now at www.ticketmaster.com. We sincerely appreciate the continued support the Sting.com fan club has shown to "The Last Ship." As a token of our thanks and to celebrate his Broadway run, we're giving away several pairs of tickets plus post-show meet & greets with Sting to our members! Tickets will be offered for the performance on Thursday, January 15. Detials here. For additional details and to enter, sign in as a member. If you're not currently a member of Sting.com but are interested in joining for access to exclusive members-only contests, ticket pre-sales, behind-the-scenes content and more? Join Sting.com here.